WEST LAFAYETTE, Ind. – Using heat to style curly hair poses a nagging problem: applying too much causes permanent damage resulting in limp fibers devoid of natural curve. Researchers are now working to learn precisely how much heat to apply and how frequently to use heat treatment for a given hair type without destroying it. "Heat treatment is a popular way to give versatility to hair, but it can be detrimental to hair health if misused," said Tahira Reid, an assistant professor of mechanical engineering at Purdue University. "The question we are trying to answer is, ‘How much heat is too much heat before you lose your permanent curl pattern?'" She is leading a team exploring this problem in collaboration with Amy Marconnet, assistant professor of mechanical engineering at Purdue. The team is applying thermal sciences to the challenge and has developed a prototype system that simulates a flat iron passing over hair. Information about the experimental system under development and preliminary results from the research will be described in a paper being presented during the American Society of Mechanical Engineers' International Design Engineering Technical Conferences on Aug. 2-5 in Boston. The research could aid not only professional stylists but also the do-it-yourself hair-care community. "The U.S. ethnic hair-care community in 2009 alone spent $9.5 billion on hair care and cosmetics, so there is a large market for this," Reid said. "Though in wide use by both the general public and professional stylists, the lack of empirical research on very curly hair hinders effective use of heat. We are showing a unique approach for integrating customer needs, design methods and thermal sciences all at once." The researchers used an infrared microscope to study how hair reacts to heat depending on various factors including the cross-sectional area of hair fibers and the degree of curl. "We need to learn what temperature and frequency of use will lead to permanent structural damage to curly hair," said Reid, who conceived the project several years ago. "I have always thought about how mechanical engineers can have an impact in this area because we are trained in heat transfer and modeling and other methods that cosmetologists do not learn. As an African-American woman, I have been keenly aware of this problem." The paper was authored by graduate students Jaesik Hahn, Tikyna Dandridge and Priya Seshadri; Marconnet and Reid. Much of the previous research and data in cosmetology literature breaks hair into three broad categories: African, Caucasian and Asian. "The whole world does not fit into these three categories," she said. "And you can't always tell by ethnicity how someone's hair will behave. I think it's better to study it based on curl pattern, whether it is naturally straight, wavy, with deep coils, and so on. Imagine that someone has a diagram they can refer to that says, 'This is my hair-curl pattern. I can use my flat iron at this temperature this number of times per month and not have any damage.'" The researchers thus far have used the infrared microscope to study the behavior of heat as a flat iron passes over strands of straight, wavy, and very curly hair types. "We are trying to see if the heat-transfer data will correlate with damage," Marconnet said. "The system measures infrared temperature maps, and we have heat-transfer models that try to understand the physics of what's going on, but there is not a good understanding of the heat transfer because the hair strands are not all identical. Every one is unique and their properties aren't well understood." The researchers also are performing predictive modeling work aimed at helping to inform people in advance of the effects that certain temperatures and frequencies of use will have on their hair. "We hypothesize that heat is going to move differently through different kinds of strands," Reid said. "One thing we see very subtly is that it takes longer for the heat to dissipate out of the straight hair than the curly hair. However, we need to study more samples and control the experiments to see the effects on a more statistically significant level." The research also could have other applications. "From a heat-transfer point of view, the same tools and techniques we use to study the hair fibers, I use to study carbon nanotube and nanofiber wires and ropes that are used to enhance strength of composite materials," Marconnet said. "Furthermore, understanding how heat transfers between fibers in fiber bundles is broadly applicable in the textile industry." A video is available at http://youtu.be/3HFeqGhiGu0. 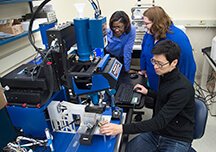 More information about the research is available at http://engineering.purdue.edu/reidlab and https://engineering.purdue.edu/MTEC. Although the hair care industry is a multi-billion industry, there still remains a dearth in the available technologies and research methods to answer one simple question: What temperature and frequency of use will lead to permanent structural damage to curly hair (i.e. heat damage) in human hair? Currently, trained professionals in the hair industry cannot predict when heat damage will occur and often rely on heuristics and intuition in their hair care approaches. In addition, scientists that have conducted studies with heat and hair have often used European hair types, which cannot be generalized to all ethnic groups; they have also conducted experiments that are not ecologically consistent with individuals’ use context. As a result, a number of lay scientists have emerged whose use contexts are ecologically valid, but are lacking the experimental and quantitative rigor that engineers can provide.